Petr Ginz, 1928-1944 (Yad vaShem). 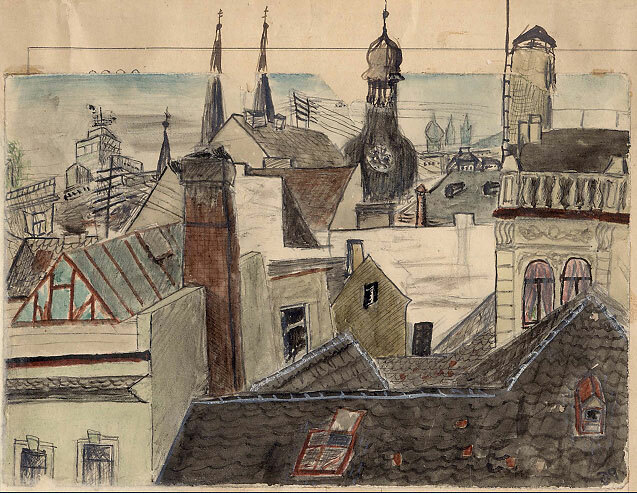 Born in Prague, Petr spent his adolescence in the children's home in the Theresienstadt ghetto. He was murdered in Auschwitz-Birkenau in the fall of 1944. 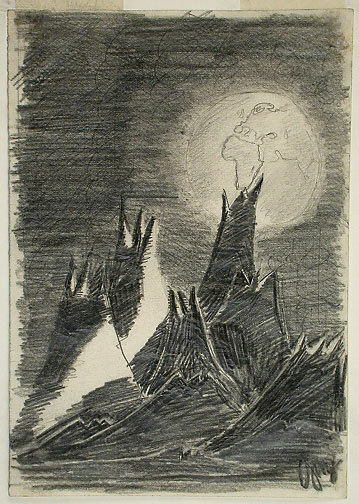 In 2003, Ilan Ramon, the Israeli astronaut that perished in the space shuttle Columbia, took Petr Ginz's drawing 'Moon Landscape' (see below) with him from the Yad Vashem collection. I had the wonderful opportunity to visit the Czech Society for Analytical Psychology, to deliver a lecture and a workshop on the Cycle of Life. Following several years of experience with the impressive Bulgarian Jung Society, as well as visiting the groups in Poland, Estonia, and the Czech Republic, I can testify to the admirable devotion and seriousness found among the analysts, therapists and students in these countries. Their thirst for knowledge is a source of inspiration, and in only a few years the therapists in these countries have gained increasing psychotherapeutic experience. It was a great joy to lecture to the members of the Czech Society, to an attentive audience of analysts and analysts to be, Jungian oriented therapists and students. 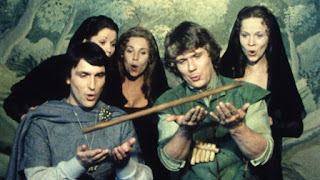 The weekend was particularly moving and meaningful because of Dvorah Kutzinski, who gave two related seminars – one on Erich Neumann’s Origins of Consciousness, and a seminar on Mozart’s The Magic Flute, including the screening of Bergman’s wonderful movie. At 87, Dvorah Kutzinski, the Grand Old Lady of Jungian Analysts in Israel, is as sharp, witty and vital as ever. Coupled with her awareness of old age and death, she is full of life and energy, leaving many of us behind. Her charismatic personality comes across in lectures and seminars, therapy and supervision, as her students, analysands and colleagues of more than fifty years will attest. The person she is and her individual life are deeply intertwined with the history and culture of the 20th Century. She grew up in the house in which Kafka was born, with Max Brod, to whom we owe the preservation of Kafka’s manuscripts, among the weekly guests in their home. 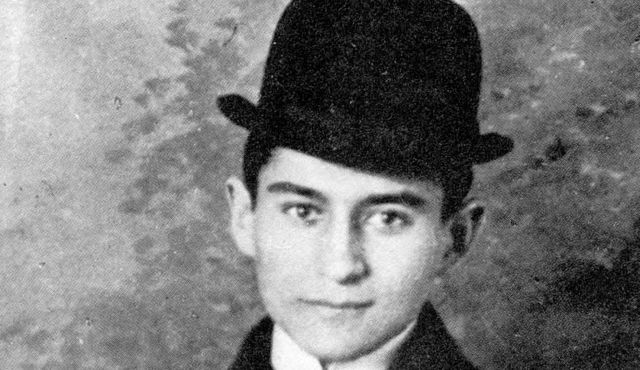 Her father, the philologist Prof. Zeckendorf, later one of the famous lecturers at Theresienstadt, predicted Kafka’s future long before his rise to fame. 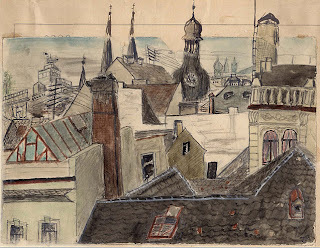 After years in Theresienstadt and Auschwitz, she arrived at the shores of Israel, and met Erich Neumann. She became a close friend and his foremost disciple, making his writings accessible to generations of Jungians. And the Czech she hasn’t spoken for seventy years, emerged from the depths of memory. She was received, as she so rightly deserves, with great warmth and appreciation. Regarding the whereabouts and recent findings about the Golem of Prague, I have been sworn to silence and cannot yet disclose anything. It will have to remain shrouded in mystery, until it eventually will emerge from the hiding place in the shadows of science. Let me only mention that the story about the golem of Prague, based on the legend of the sixteenth century Rabbi Loew from Prague, was revived at the turn of the century by several authors, notably Gustav Meyrink. Meyrink had been a bank manager, before turning to alchemy and Kabbalah. He was convinced that the Philosopher’s Stone was to be found in the Prague sewer system, and from serious research into this matter, I have found conclusive evidence that the stone probably is to be found in the nigredo of Prague’s shadow. Thank you for your report from Prague. 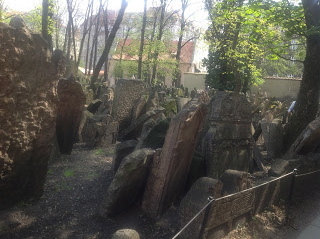 I visited the Jewish cemetery and Synagogue in that wonderful city. It's incredibly beautiful and meaningful. I am sure they appreciated your lecture.